As mentioned on this blog on Tuesday, the applicant wanting to turn the old bank Chambers into a Mosque has lodged an appeal against last December’s Development Control Committee decision to turn the application down. We all found this out from letters which arrived last week, many (if not all) which were dated 25th July but post marked 29th July, about the appeal which was lodged on the 15th of July, giving us six weeks from the 15th to make representation but in reality giving us less than four. While questions need to be asked about the avoidable loss of two important weeks, the focus must be on getting good submissions into The Planning Inspectorate that robustly set out whatever position you might hold, taking into account the Grounds of Appeal put forward by the applicant. 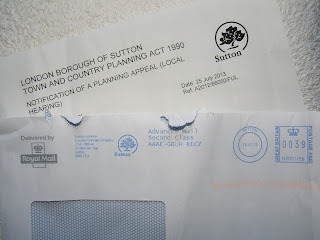 It is also duly noted that, similar to the application last year, this appeal has been timed to coincide exactly with the summer holidays, perhaps when people have less time to read, worry about, scrutinize and object to planning applications? Surely it must only be a coincidence. “The issues are complex as the issue of whether the proposed mosque would affect the available parking spaces on surrounding roads or give rise to conditions prejudicial to highway safety is in contention. The transport expert's opinions are in dispute and can only be satisfactorily resolved by cross examination by a legally qualified advocate. (This was in answer to “Why it is essential for the Inspector to enter the site (continued)”). “The appellant asked for this appeal to be dealt with by the inquiry procedure. However, we have applied the criteria and considered all representations received, including the appellant's preferred choice. We consider that the hearing procedure is the most suitable for this appeal as, based on the evidence before us, we are not satisfied that an inquiry will be necessary. In our view the issues of parking and highway safety and the absence of a Planning Obligation raised by the grounds of appeal and Council's reasons for refusal would benefit from an informal discussion led by the Inspector at a hearing, but cross examination will not be necessary and there is no evidence that legal submission will need to be made. 1.1 In June 2012, an application was submitted which sought permission for a permanent change of use from vacant offices to a place of worship. The Council refused the application, under ref: A2012/660501FUL, and that decision is the subject of this appeal. The decision notice, dated 6th December 2012, alleged two reasons for refusal. 1.2 The first reason for refusal alleged that the proposal failure to provide any off-street car parking spaces results in insufficient parking provision in an area with high levels of demand for on-street parking, which would exacerbate existing parking pressures on surrounding roads, giving rise to conditions prejudicial to highway safety and thus causing danger and inconvenience to all users of the public highway contrary to Policy DN22 of the Site Development Policies Development Plan Document March 2012. The second reason for refusal alleges that in the absence of a S106 agreement or Unilateral Undertaking, the proposal would fail to provide adequate contributions towards a variety of environmental improvements and community benefits and would not provide for adequate cycle storage. This would be contrary to policy DP2 of the Core Planning Strategy and SPD 5 'Planning Obligations'. 1.3 It should be noted that the Officer's report (a copy is attached) on the refused application scheme (ref: A20l2/66050IFUL) addressing to the Planning Committee confirms that the proposed change of use is acceptable in terms of Land Use, Design and Layout, Impact on Neighbours, and other Material Considerations such as noise and disturbance, loss of privacy, flooding, crime, wildlife and refuse and recycling arrangements. There are no planning issues other than available parking spaces only on Fridays and Festivals days when the proposed mosque was expected to accommodate its maximum capacity of 140 people (only 60 prayer sessions per year). There are no parking or traffic issues to use of the building as a place of worship on a daily basis as it is expected only 10-15 people attending anyone prayer which would be less than in comparison with its lawful office use. Therefore, the parking and traffic issues as alleged in the decision notice only concerns when the property accommodates its maximum capacity of 140 people. l.4 A large number of Muslim communities live around the appeal site and work within Worcester Park District Centre. The Case Officer's report (paragraph 5.11) concludes that HA key proposition in support of this application is the applicant's assertion that a significant number of worshippers within a 2 km radius would walk to the site and noting the evidence submitted to demonstrate local demand it is considered that the applicants have sufficiently demonstrated there is a need for a proposed mosque in this location (our emphasis)." It is the appellant's case that the proposed mosque would specifically meet the identified needs for a place of worship for Muslims who presently live and work within Worcester Park. The local Muslims are fully aware that this is a car-free mosque and no parking spaces available. Any disabled people or families who depend on cars would continue to visit the other mosques nearby. 1.5 Due to the appeal site's location within the Worcester Park District Centre, it enjoys good public transport facilities, particularly bus stops and Worcester Park Railway Station within 220 metres from the appeal site. By having zero parking on site all users would know that the only means of accessing the site would be by sustainable modes of transport, either by foot, bicycle and using public transport. Furthermore, the proposal also includes provision for 16 secured cycle parking spaces which will encourage worshippers travel by bicycle. 1.6 In addition, it is recognised that there are numerous trips associated with those living within the Worcester Park area travelling to existing local mosques. If the proposed mosque was provided, the distance travelled by existing residents in the Worcester Park area to local mosques would be significantly reduced. This would reduce the number of vehicular car trips, resulting in a net benefit to the local highway network. Furthermore, from analysis of the TRAVL database when comparing the lawful office use at the site with the proposed mosque there would be a reduction in the number of vehicular trips throughout the week, including a Friday. 1.7 It is the appellant's case that all attendees being within a short walk of the site, they would visit the site either by food, bicycle and using public transport. The proposal would neither affect the available existing parking spaces on surrounding roads nor give rise to conditions prejudicial to highway safety. On the other hand, as mentioned above, the proposal would reduce the vehicular trips and ease the traffic on the local road network. Therefore, the proposal would not conflict with the Policy DN22 of the Site Development Policy DPD (March 2012). 1.8 With regard to second reason for refusal, the appellant is willing to enter into a S106 agreement or Unilateral Undertaking, should this appeal be allowed. On request, the appellant will prepare and submit the draft UU, in due course.